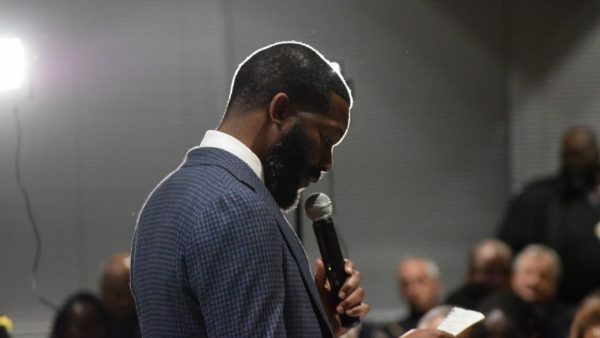 Mayor Randall Woodfin during a community meeting in January 2019. Woodfin highlighted several changes he had made to the mayor’s office, including the creation of an Office of Social Justice and Racial Equity and the transformation of the Office of Economic Development into the Department of Innovation and Economic Opportunity. For the latter department, he said, “their marching orders are clear: provide more opportunity for women- and minority-owned (businesses) in Birmingham.” That office helped facilitate the creation of 2,100 new jobs in the city in 2018, he said, the most the city has seen since 2011. “We can only expect that number to rise this year,” he said. He repeated his promise “to talk to CEOs and grocery stores around the country to alleviate the issue of food deserts” in the city, and he promised that “a more robust update” on his administration’s strategic plan would come in March. “Violent crime is a public health care crisis in our city that will require all of us working together to make a difference,” he said. He reiterated his belief that a more holistic approach to addressing crime — through prevention and re-entry services, not just enforcement — was the best way to approach that crisis. Community participation, he added, was essential. “There’s more to public safety than simply flooding our blocks with badges,” he said. “We are looking to create robust neighborhood watch programs with block captains because no one knows neighborhoods better than those who walk its streets daily. It’s the concerned, loving mentors, big mamas, aunties and respected elders who will help us take our streets back,” he said.